There are definite indications that the Canadian housing market is starting to stabilize after a market slump in the first half of the year. Experts are anticipating that the GTA housing prices will remain high, rents will rise, and mortgage rates will continue to creep up. Let's take a Look at what that Means for both Buyers and Sellers. Even though transaction volume has slowed, housing prices appear to be holding steady … and, in fact, continue to rise in many markets. While the national average price is projected to decline slightly this year (by 2.1 percent to $499,100), it’s expected to rebound in 2019 (by 3.8 percent to $518,300). The current year decline primarily reflects fewer higher-priced home sales rather than a reduction in housing value.1 The new mortgage standards instituted in January, combined with rising interest rates, has reduced the budget of many buyers who must now seek out lower-priced homes. This trend towards lower-cost housing has helped to bolster the condominium market. Condos in many urban areas have continued to see double-digit price increases despite the overall market slowdown. Since 2017, Toronto two-bedroom condos have appreciated by an average of 7 percent and one-bedroom condos have appreciated by an average of 11 percent, with some neighbourhoods seeing appreciation as high as 47 percent.4 And in Vancouver, condo prices have risen 10.3 percent in the past year.5 At the same time, there are signs that an already hot rental market may be overheating. Rental prices rose by double digits in 13 out of 25 Canadian cities in the past year.6 And according to a recent study by Mortgage Professionals Canada, in the majority of markets, the monthly cost of homeownership is lower than the cost of renting equivalent housing. In fact, the study found that if mortgage rates remain at 3.25 percent, the cost of ownership over a 10 year period will be lower than the cost of renting in nearly 98 percent of cases. And even if rates rise to 5.25 percent, homeownership would be less expensive than renting in 82 percent of cases.7 "The report demonstrates that the money Canadians are spending on monthly rent, if used instead to finance a home, would be a very beneficial investment over time," explained Will Dunning, author of the report. "The costs of owning and renting continue to rise across Canada. However, rents continue to rise over time whereas the largest cost of homeownership – the mortgage payment – typically maintains a fixed amount over a set period of time – usually for the first five years. The result is that the cost of renting will increase more rapidly than the cost of homeownership. "7 This is good news for sellers since residents become more incentivized to purchase a home as renting becomes more expensive. It also signals a growing opportunity for investors interested in buying a rental property to see lucrative returns. Unfortunately, buyers who were waiting for a huge drop in prices may be disappointed. A robust economy coupled with strong demand is expected to keep prices high for the foreseeable future. On the plus side, a slower market and increased competition have made many sellers more willing to negotiate. The Bank of Canada has signaled plans to fight inflation by gradually raising interest rates. After two rate increases so far this year, it declined to raise rates in September due to uncertainty surrounding NAFTA negotiations. Still, many economists expect to see another rate hike in late October.8 “Assuming those downside risks do not intensify over the coming weeks, we believe the (Bank of Canada) will raise interest rates at its October meeting, consistent with its gradual approach to policy normalization,” reported economists at National Bank.8 Higher interest rates impact mortgage rates. They also raise the bar for buyers applying for a mortgage under the new stress test requirements. So buyers who are concerned about qualifying should consider acting soon before rates go up further. According to the Royal Bank of Canada, the average Canadian household needed to allocate 48.4 percent of their income to carry the costs of owning a home purchased in the first quarter.6 “Higher mortgage rates were the main contributor to the rise in ownership costs,” said Craig Wright, Senior Vice-President and Chief Economist at RBC. “With the prospect of more interest rate hikes in the period ahead, there’s a definite risk that affordability will erode further in the coming year. If you’ve been waiting to buy a home, it may be time to strike. This is the most balanced market we’ve seen in years, which means greater choice and increased bargaining capacity for buyers. But you may need to act soon. Rising interest rates will decrease your purchasing power, especially in light of the new stress-test requirements. And as rental prices climb higher, you’ll be paying more each month for housing. Doesn’t it make sense to start putting those dollars towards building equity in your very own home? If you’re in the market to sell, there’s good news for you, too. Demand for housing and a strong economy has kept prices high. But the new, more-stringent mortgage requirements have narrowed the pool of potential buyers who can afford to enter the market. Be sure to seek out a real estate agent who utilizes technologically-advanced marketing tactics to reach qualified buyers in your area. While national real estate numbers and predictions can provide a “big picture” outlook, real estate is local. 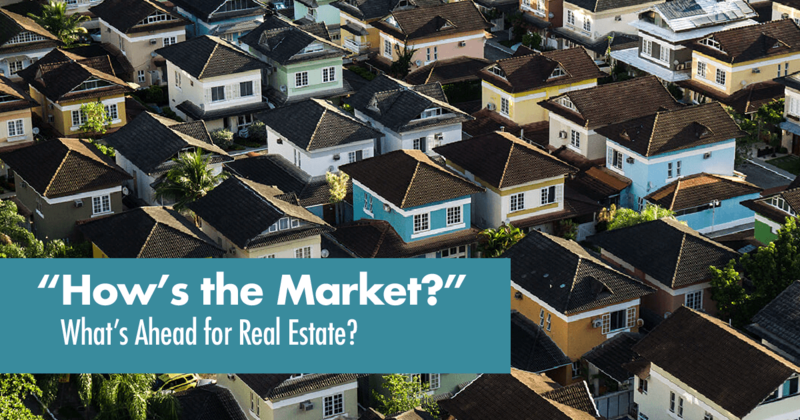 As local market experts, we can guide you through the ins and outs of our market and the issues most likely to impact sales and home values in your particular neighbourhood. If you have specific questions or would like more information about where we see real estate headed in our area, let us know! We’re here to help you navigate this changing real estate landscape.